The other day, I was looking over my outline for my WIP, Unperfected, to determine how many chapters I had left. My goal chapter-count wise was 40 chapters, but currently I have the book plotted through 42. That's not too bad, and I can always go back and try to condense everything to under 40 chapters if I really want to. After all, this is my first draft. My goal is to just get all of the words down and finish the draft. But that got me thinking--when am I going to finish? 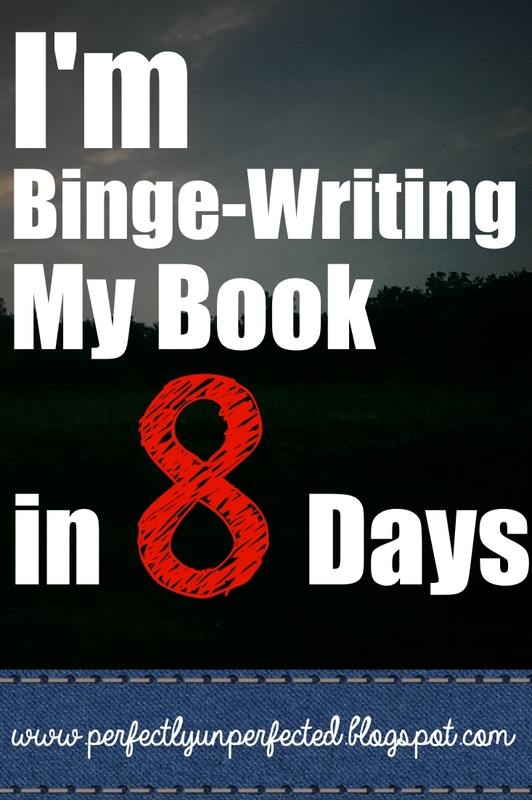 I was on chapter 29 at the time, and I decided it was about time to set a deadline for myself. As a lot of you guys know, I'm not very great with deadlines. I've never really known why they don't work for me, they just never have. But I decided to give it a try. 3/24/16. March 24th, 2016. As in one year ago next Friday. I don't know about you guys, but that immediately felt like a challenge. I was one chapter 29 on Tuesday, the 14th, which meant I had 10 days to get through chapters 29 to 42. 10 days to write 14 chapters! For some of you, that may sound like an easy challenge. But for me personally, that sounded super tough. I tend to be a pretty busy person, and often I'm lucky to write a whole chapter in four days. This meant more than a chapter a day, and it seemed pretty impossible. Flash forward to today, a mere two days later. I just finished chapter 34! I have myself on a set schedule and I'm determined to get this draft finished before the one-year mark. And why is that? Because I have a deadline that actually means something. If you struggle with deadlines like me, but don't know why, your problem might be that your deadline isn't meaningful enough. For example, when a teacher gives you a due date for a paper, you usually get that paper done before that date, right? That's because the date has meaning. If you don't turn the paper in before then, you might not get a grade for it. With writing, we don't always have deadlines that come with consequences. Deadlines never worked for me because I would always just pick a random date--a date with no significance. I knew in the back of my mind that if I didn't finish by that date, nothing would happen. That led to me slacking off and never meeting my deadline. Now that I'm experimenting with deadlines and schedules more, here are a few tips and tricks to help you create the perfect deadline! 1. Choose a date with meaning. As I said before, this is very important. If you pick a random date for no reason, it might give you the idea that you can slack off. That's not good! Pick a date that means something to you personally. For me, one year anniversaries are a big deal. I also like dates that are even, timely dates. Finishing my draft one year after starting it is a nice, even chunk of time. Other significant dates could be December 31st (before the end of the year) or the day before your birthday. 2. Choose a realistic date. Another reason I chose to try and finish my draft before the one-year mark is because I'm at a point in the story where that's realistic. If I was still closer to the beginning, that wouldn't be very realistic at all. When choosing a deadline date, make sure you give yourself enough time to finish without completely stressing yourself out. Otherwise, you'll probably end up not meeting the deadline. Once you have a deadline set, use a calendar to write out what chapter you need to write each day. I find this to be extremely helpful because it allows me to focus on one day at a time, one chapter at a time. That way I don't feel overwhelmed by my deadline or all the work that I have to do! This can be a hard one, but it's necessary. If you're going to set a deadline for yourself, eliminate excuses that get in your way. A big one for me was "I don't have time to write." While that is true sometimes, it's usually that I just don't want to write. But now that I have a set deadline that I need to meet, it's easier to eliminate that excuse. Apart from giving you guys a few deadline tips, I wanted to tell all of you about my new deadline as a way of keeping myself accountable. Now that all of you know my goal, it's extra motivation for me to keep it! I just finished up chapter 34, which means I have just eight chapters left, and eight days to write them. A chapter a day! Though I know it'll be tough, I'm super excited about the parts of the plot that I'm writing, and it makes it a little easier to get through the chapters. I'll definitely be keeping you guys updated next week as I get through the final stretch of this first draft!